It’s the eleventh month of Middie Monday, which means May will be the one year mark since I started this in an attempt to draw more attention (and to pay more attention) to Middies. I’m not sure if I’m going to do anything special for Middie Monday #12 – let me know below in the comments if you think it should be something special! In the mean time, I’ve been loving the idea of adding a third Middie to the family. I think the maximum number of Middies I would have/want would be five. Five is not an arbitrary number, if you think about it. Kitty Brighton and Lydia Melbourne take their first names from the sisters in Pride and Prejudice. As one might recall, there are five Bennet sisters, which means there are still three more names to be used (Elizabeth, Jane, and Mary). Before I started this naming scheme for the Middies, I already have a Bennett (Margaret Meets Ladybug, EBL) and a Tertiary Jane (Simply Peppermint, RBL) so I’m not sure if I’d used Jane for a Middie. Which means I have room for two more Middies. But I recently made a big purchase that was not doll related (a big shocker, I know! ), which means that acquiring a new Middie will have to wait a while. This post is a bit of a ramble about Middies, but I do love them quite a bit. 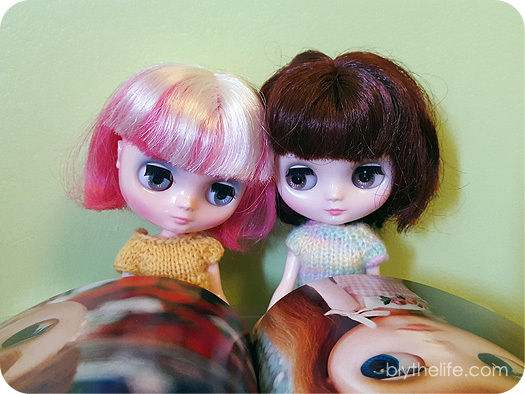 I wish I didn’t though, since it can be hard to find nice clothes for them as a lot of Etsy/Artfire sellers don’t make clothes for Middies when they do for the Blythes. My Middie (Jackie Ramone) is named Maude, which is the name of my favorite character in one of my favorite movies, The Big Lebowski. I feel like it suits her perfectly! I honestly don’t remember why I named my only Middie Missy… It just came to me the day she arrived. I just got myself my first middie! I think it might be your fault… Your middies are too cute. After much thought I decided on Iris Linea. She hasn’t arrived yet, and doesn’t have a name yet, but I already planning a dress to sew for her. I’m excited to sew for a new size! I got her NEW which is a first for me… Deboxing yay! When I first got Lydia Green middie, I fell in love with her and purchased 6 more middies afterwards. Only have 2 Neo and do not plan on get more Neo.